Hi, Readers! Mom said I could be the star of the last 2018 selfie. Of course she played around with it, but I did approve. Here’s what she started out with. Of course this was taken when things were still green outside. Now it’s pretty much brown with some white. I don’t like going outside now. I told her I really liked it ‘cuz it looked like I was surrounded by New Year’s fireworks. My long whiskers really stand out! I like to use those whiskers to tickle Mom’s face when I kiss the top of her nose. MOL!!! 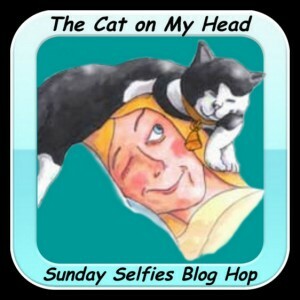 Join our other friends at the Sunday Selfies Blog Hop over at Kitties Blue’s house. Mom said that today, March 2nd, I am 9 months old. When she got me, I was just a little tiny thing and now I have a fluffy tummy and I’m getting longer and longer! Mom, are you writing about me? The Mom: Yes, Steinbeck, I’m telling your readers that it’s a special day for you. Am I older than Hemingway now? No, Hemingway’s age is counted in years and your age is still counted in months. When do I get to be years? In another three months. On June 2nd you will be one year old! Then can I go out on dates? No, you can’t leave the yard. Did you really just tell the readers that I can’t go out of the yard? You make me sound like such a baby! Where’s the delete button??? Don’t worry, Steinbeck. They all know that you are getting to be a big boy. I love you and wish you a Happy 9 Months Birthday! Mom got this idea from our dear friends, the Colehaus Cats. 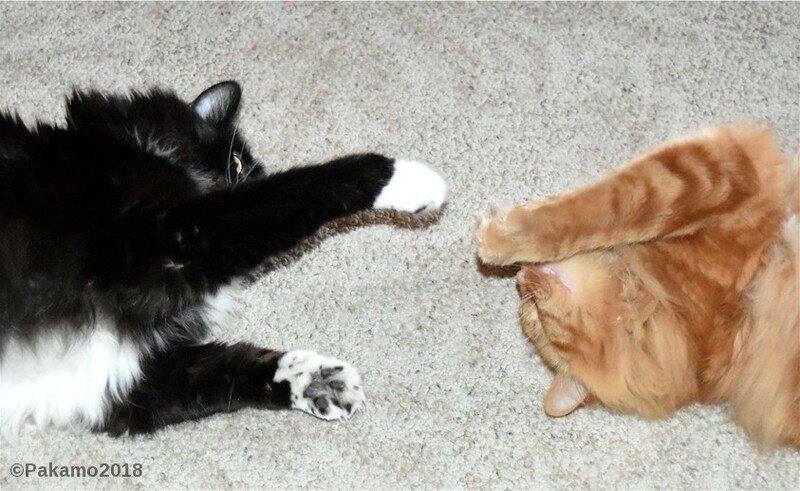 Their ginger kitties showed off their pretty furs in black and white. I just had to do the same thing!!! Frankly, I like my ginger furs better, but that’s just me. I had to try this out as well, but my furs are just meant to be black so I’m sticking with that. My black furs make me look regal. What can we say? It’s Monday night and Mom was bored. Where did the week go? Mom said I could be the star again today ‘cuz the little guy gets so much attention. Actually, I just took over the camera. MOL!!! I hope you are having a wonderful “Sunnyday”!!! 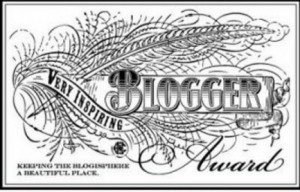 Check out what my other friends are doing at the Blog Hop. Mom! Do you have to take a picture of me while I’m bathing??? For a week or so, the weather people have been telling everyone around here that we were going to be buried in snow by this time. Mom got tired of hearing them talk about all the white stuff. After all, just last Sunday our humans had a BBQ out on the deck and it was around 60. All of us were hoping that maybe winter decided to leave early. Then the weather people started talking about all this white stuff coming. Mom said she didn’t want any white stuff. Eben her friends were hoping the white stuff would stay away and that the weather people were telling tails. Oh, right. Anyway, we wanted to call the weather people and tell them to cancel the white stuff ‘cuz Mom didn’t want any. We thought she deserved to have a nice surprise. Mom says the weather people have to stop teasing us. Oh, it’s cold out there this weekend but it sure isn’t white here. Mom says just south of us there’s lots and lots of the new white stuff, but it missed us. Even though winter hasn’t left yet. Mom said that I am “curiosity catified”. I have no idea what she means. She means you are nosy and into everything. Here I am contemplating the situation. There’s something up there that has captured my attention! When Mom saw this pose, she changed my name! I am now Steinbear the Magnificent!! I live with an idiot! Howdy, Readers!!! I had an adventure today and Mom said I could tell you all about it. First of all, she said I have to explain that this is February and this is Minnesota and this weather just doesn’t seem right. The humans are even going to have a BBQ this afternoon when they should be bundled up in jackets and shoveling snow! Since this is my first February, I have no idea what the weather is supposed to be. Well, I got to go outside and I had fun!!! I did it! I went outside to explore and feel the sun on my furs. This is how I started. I wasn’t sure if I wanted to be inside or outside, so I chose both! Mom put one of my favorite boxes outside so I could hide. Now nobody can see me. Mom says this is my lion pose and she loves it! Now go visit the Sunday Selfies of my other friends. Have a wonderful weekend, everyone! Don’t forget to check out everyone else at the Caturday Art Blog Hop! We wanted to wish all of you a day full of love and kindness!